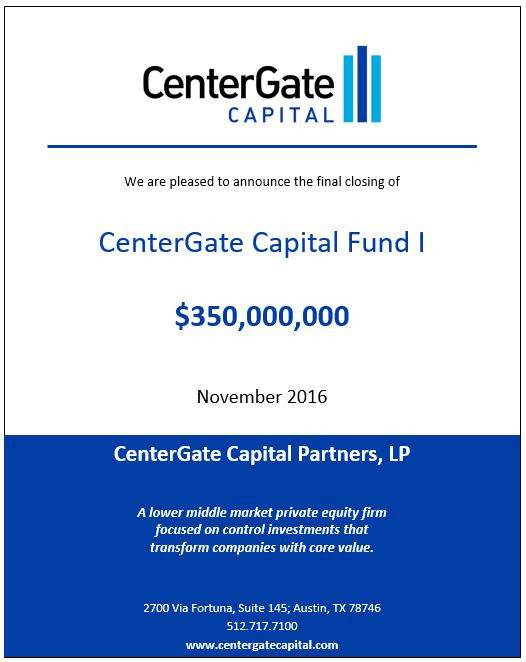 Austin, TX (December 15, 2016) – CenterGate Capital Partners, LP (“CenterGate”), a leading private equity firm, announced today the final closing of CenterGate Capital Partners I (“CenterGate Fund I” or the “Fund”). CenterGate Fund I, with $350 million in investor capital commitments, will focus on control investments that transform lower middle market companies in North America. CenterGate Fund I, which had a $300 million target, is the first institutional private equity fund for the firm and was substantially oversubscribed. “Despite strong demand, we proactively kept the size of the fund capped at $350 million so we can adhere to our niche investment strategy” added Lewis Schoenwetter, Managing Director. The CenterGate investment team is managed by co-founders and partners Tiffany Kosch, Lewis Schoenwetter, and Stenning Schueppert.